The DeLonghi DD45P Dehumidifier is an Energy Star qualified small capacity unit and is suitable for areas of up to 700 sq ft (manufacturer's recommendation). In common with the more powerful DeLonghi DD50P this dehumidifier has an internal condensate pump, an unusual feature in a room dehumidifier. It also shares the ability to operate in low temperatures and is a more economical alternative for anyone with a small basement or single room where a dehumidifier is needed. The DeLonghi DD45P Dehumidifier is fitted with an adjustable humidistat which is an essential feature for a number of reasons. The humidistat works by sampling the air at intervals and measuring the relative humidity. If the humidity rises above the percentage you have pre-set the unit cycles on and operates until your preferred level is restored. This ensures that the dehumidifier operates only for the minimum time required to maintain your chosen setting and thereby saves money on energy bills. You will naturally choose a level of relative humidity which is comfortable for you and your family and, of course, you want to protect your home and its contents from mold and other moisture damage. A level of 60% relative humidity will protect your possessions, a level of no higher than 50% is necessary to control dust mites which can be a source of allergens, maybe making life difficult for you or a family member. The humidistat is your guarantee that both people and property in the house will be protected. Lower is not always better when it comes to relative humidity and at 30% most people find the air uncomfortably dry. At levels below 40% some materials, particularly wood and leather, dry out excessively and start to deteriorate. so, if we want to control the dust mites and protect our goods a level of between 40% and 50% is desirable, a pretty narrow range. The humidistat not only stops RH from rising too high, it keeps it from falling too low so maintaining a "perfect" level for the people we love and the things we treasure. The DeLonghi DD45P Dehumidifier incorporates auto-defrost, a feature which allows it to operate at temperatures as low as 41°F. It does this by delaying the formation of ice on the refrigeration coils and makes the DD45P entirely suitable for use in cool areas of the home such as a smaller basement. A rare feature of the DeLonghi DD45P Dehumidifier is its internal condensate pump. Most room dehumidifiers do not have this advantage and users must either empty the water collection container by hand or drain water to a nearby floor drain on the same level as the dehumidifier. Both these methods are options for using the DD45P but neither may be suitable in some basements. The condensate pump allows water to be discharged to a drain or other outlet on the level above because it is powerful enough to force the water around 16ft vertically. 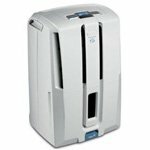 The DeLonghi DD45P Dehumidifier is portable and conveniently placed side carrying handles and the addition of caster wheels make it easy to move to different parts of the home as required. It also features easy to use electronic controls, a washable air filter, a timer and two fan speeds so comes with all the capabilities needed in a versatile home dehumidifier.